One of my favorite sources for Chinese food is not really a Chinese restaurant. 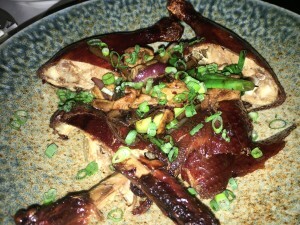 It’s The Source, a Wolfgang Puck restaurant, where Executive Chef Scott Drewno exhibits a finesse for creating Chinese dishes such as dumplings, roast duck, and steamed buns. Since my last visit to The Source, there has been a renovation to its menu and decor. 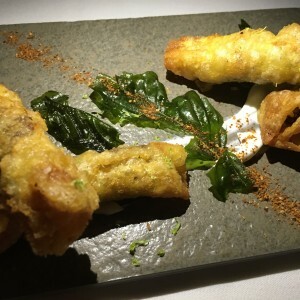 We ascend a staircase into the sleek upstairs dining room, and step into an upscale dining experience, and a menu that may be described as Asian fusion or Asian inspired, or actually… just plain inspired. I’m taking a break from a conference with five colleagues. We’re weary from a long day of work and uninteresting hotel food. A foamy Asian pear martini, with a thin slice of pear floating on top, is just what we need to transition ourselves into relaxation mode. Spicy tuna tartare with sesame-miso cones are a long-standing popular starter at The Source, and I’m relieved to see they have made it through the revamped menu. A selection of dim sum is a happy way to explore Chef Drewno’s exploration into China’s various tastes and textures. 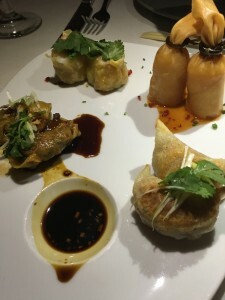 Crispy chicken dumplings, lobster spring rolls, pork potstickers, and scallop siu mai square off on the appealing plate. Deliciously warm scallion rolls are a well-seasoned companion to the dim sum assortment. As spring approaches Chef Drewno is prepping new dishes, and we squeal with delight as we are treated to a preview. A new star is about to emerge at The Source- a hot, crispy cumin lamb dumpling with a cooling side of yogurt sauce. As a single dumpling bite lingers on the plate, I sock it away and to savor so it’s my last bite of the night. 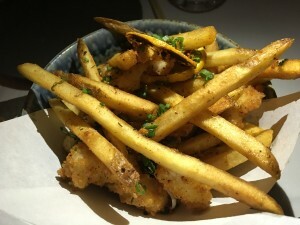 Wok fired blue catfish with fries is reminiscent of beach food, but with an Asian twist. (Ooh, anyone remember the television show China Beach with Dana Delaney?) Oops, I digress. For those who prefer to duck out, poached Atlantic cod with fragrant chili oil is equally gratifying, if not quite as showy. The accompanying lobster fried rice and wok fired root vegetables provide jolts of flavor. The Source has an array of offerings on the ground floor that transforms it from a fine dining venue to one you want to visit regularly. I’m salivating over the idea of a hot pot experience for four (who wants to go with me!?) 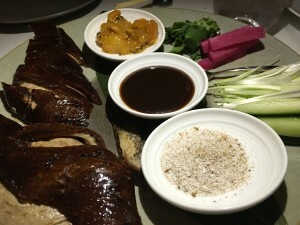 There’s a lounge menu featuring a variety of dumplings, wok fried dishes, and bbq items including bao buns with roast pork or Chinese duckling. Mondays feature $5 dumplings all night long. I recently attended a symposium entitled “Celebrating Food!” sponsored by Les Dames d’Escoffier, DC Chapter. A session called “Rethinking Immigrant Cuisine” included a discussion about the words ethnic and authentic in describing restaurants. The Source comes up as an example. Is it ethnic? Is it authentic? Does it really matter? One of the things I love most about restaurants is how they can transport us away from hectic everyday life, and into a delicious new reality. The Source is the perfect source for an inspirational journey.